Ed Diab serves as the Managing Attorney of the firm’s mass tort practice, focusing on pharmaceutical, medical device and wildfire litigation. Mr. Diab began his career as an active trial attorney focused on complex plaintiffs’ elder abuse and medical malpractice litigation. This experience gave him the opportunity to successfully litigate these matters through trial in a first and second chair role. He was then given the opportunity to open the west coast office of a national insurance subrogation law firm and served as the office’s Managing Attorney for several years. Ultimately, Mr. Diab returned to the representation of injured plaintiffs in his role at Gomez Trial Attorneys. Currently, Mr. Diab is involved in numerous cases including metal-on-metal hip replacements, fluoroquinolones (Levaquin, Cipro and Avelox), Actos, GranuFlo, IVC Filters and Taxotere. Mr. Diab was also actively involved in the widely publicized lawsuit against Pacific Gas & Electric arising out of the 2010 San Bruno Gas Pipeline Explosion that leveled 38 homes and killed 8. He represented numerous plaintiffs with property damage claims arising out of the 2013 Powerhouse Wildfire in Los Angeles that scorched more than 30,000 acres in Santa Clarita. He also has extensive experience litigating gas explosion and wildfire claims in Montana, Washington and Texas. 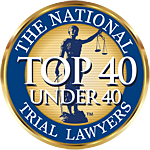 Mr. Diab was recognized in 2015, 2016 and 2017 as a Rising Star by Super Lawyers magazine, recognition reserved for only the top 2.5% of attorneys in California. In 2013, he was named a Rising Star by the San Diego Attorney Journal. In 2010 and 2012, Mr. Diab was selected as a Top Young Attorney by San Diego’s leading legal publication, The Daily Transcript. Recently, he was also selected “Top 40 Under 40” by The National Trial Lawyers organization. Mr. Diab completed his undergraduate education at the University of California at Davis, obtaining his Bachelor of Arts degree in Economics in 2005. In 2008, Mr. Diab obtained his law degree from California Western School of Law. During law school, he received the Scholarship for Academic Achievement and gained membership into the Pro Bono Honors Society through his efforts in assisting victims of torture obtain asylum. He was also an educator in the Street Law program designed to teach troubled youth at the high school level about law, democracy and human rights.